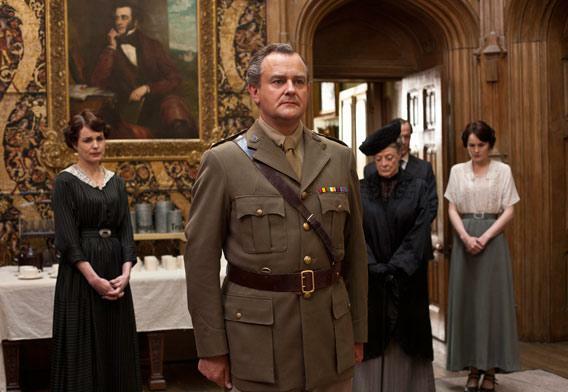 Downton Abbey Season 2: Amnesia, paralysis and murder. Armistice at Downton. Not pictured: Li’l Crawley. Nick Briggs/Courtesy Carnival Film & Television for MASTERPIECE. Add “paralysis that doesn’t stick” to the list of soap-opera tropes hauled this episode from a dusty trunk in Julian Fellowes’ attic, right next to “implausible amnesia” and “mysterious stranger.” What else? Why, murrrrrrrrrderrrrrr, of course. Bates’ field trip to London—before which his face was set in so murderous a scowl that even O’Brien blanched—ended, somehow, in his wife’s death, and while I’m reasonably certain that Bates himself didn’t do the deed, I’m immensely pleased that it done got did. Like you, Seth, I wouldn’t put it past an enraged Mrs. Bates to off herself just to eff her ex. But probably it was Thomas, his formerly icy feelings towards the valet transformed in an instant simply by seeing this photo of Brendan Coyle holding a baby. Where were we? Oh yes, last night’s episode. I really love/hated it more than ever. New maid Jane’s awkward enthusiasm when Lord Grantham offered to write a letter for her son! (They will bone soon, I’m certain.) Carson’s sad goodbye to Mrs. Hughes! (I worry that they will never bone.) Sir Richard’s shocking kiss, sealing the deal as far as he’s concerned but maybe digging that relationship’s grave! The Return of Lavinia! The dowager countess somehow jujitsuing Isobel into rushing off to help refugees and leaving Downton to return to its former glory! The moment of silence for the fallen troops, which maybe doesn’t deserve an exclamation point but which I’ll give one anyway because it was so sad yet laughable given how on this show the war has been viewed mostly through the lens of how the deaths of millions might affect the number of footmen available to serve dinner! Anyway, it was great. June, you realize that P. Gordon is a gigantic fake, right? “Fräulein Kelda,” indeed.